Bobaflex have announced tour dates to continue to promote their latest release Eloquent Demons, their 8th release, that dropped in August 2017 on Thermal Entertainment. The band in conjunction with the tour are releasing their first vinyl for the album as well as a special digital EP that contains 5 versions of the upcoming single to radio Lights Out (to be released January 26th). 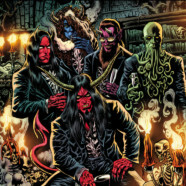 Vinyls for Eloquent Demons can be ordered here: https://www.theofficialbobaflex.com/store and should be available in record stores in February. Bobaflex consists of Marty McCoy (vocals, guitar), Shaun McCoy (vocals, guitar), Tommy Johnson (drums), Jymmy Tolland (bass) and Jake Earley (guitar, vocals).